The purpose of this paper is to present an evolutionary perspective on entrepreneurial learning, whilst also accounting for fundamental ecological processes, by focusing on the development of key recurring knowledge components within nascent and growing small businesses. The paper relates key developments within the organizational evolution literature to research on entrepreneurial learning, with arguments presented in favour of adopting a multi-level co-evolutionary perspective that captures and explains hidden ecological processes, such as niche-construction. It is argued in the paper that such a multi-level focus on key recurring knowledge components can shed new light on the process of entrepreneurial learning and lead to the cross-fertilization of ideas across different domains of study, by offering researchers the opportunity to use the framework of variation-selection-retention to develop a multi-level representation of organizational and entrepreneurial learning. 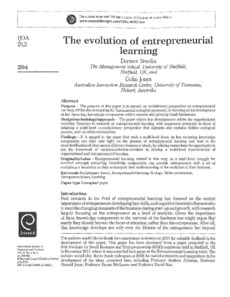 Entrepreneurial learning viewed in this way, as a multi-level struggle for survival amongst competing knowledge components, can provide entrepreneurs with a set of evolutionary heuristics as they re-interpret their understanding of the evolution of their business.